So far so good on my attempt to start eating better and stop the horrible food binging! I've lost 3 of my 7 pounds I gained this holiday season! I've successfully cleaned out our cupboards and fridge from all things bad for us, stocked shelves with healthier options of snacks and staples, and actually even got back into the routine of making some of our most loved unprocessed foods! Hoping to continue on this lovely path! Wheeeeeeee! Ok so I have to tell you, though! I received a generous 32 ounce jar of Tropical Traditions delicious Gold Label Virgin Organic Coconut Oil in the mail a few weeks back. SCORE to the max! My husband and I live off of coconut oil! We love it so very very much! It is one of our main household staples. I couldn't believe Tropical Traditions wanted to offer us some actually! This was such an answer to prayer, for us. Coconut oil can be quite pricey and we had run out - so to be offered such a large quantity as a gracious gift from them, was just amazing. Needless to say, once we received it we dove right in! We enjoyed this jar smeared on toast, used some to sauté yummy foods (has a very high smoking point so it's great for cooking), I even rubbed a little bit into the tips of my hair for a deeper conditioning on my super split ends, and used some on my wintery dry cracked hands. Coconut oil rocks. So many versatile possibilities. Seriously. Interested in just a few ways to use? Click here for inspiration! If you've never tried coconut oil- please do. So so so good (and good for you...in moderation of course). One thing I love to do with coconut oil is use it in place of butter or oil in baked goods. Having started back up on my healthy train, coconut oil is a huge daily food staple. My favorite recipe- granola! And boy do we Mains love us some granola. You probably knew that already though. Homemade = the best. Having run out of our unprocessed breakfast love, I knew I needed to bake a large batch of granola asap. My husband eats it by the bowlful every day! 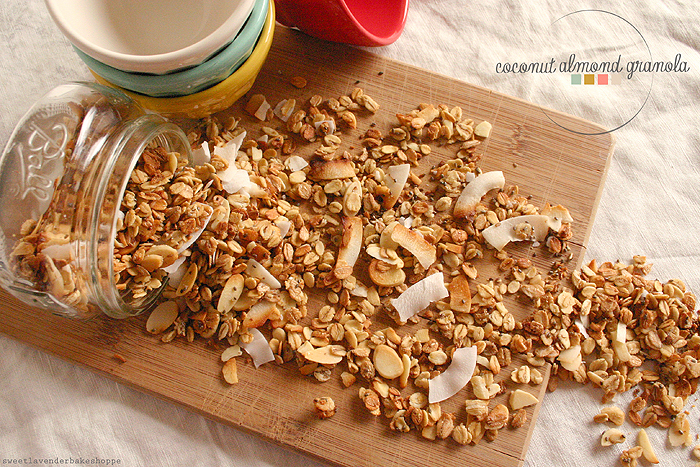 I decided to really go with the whole coconut thing in this particular granola recipe. 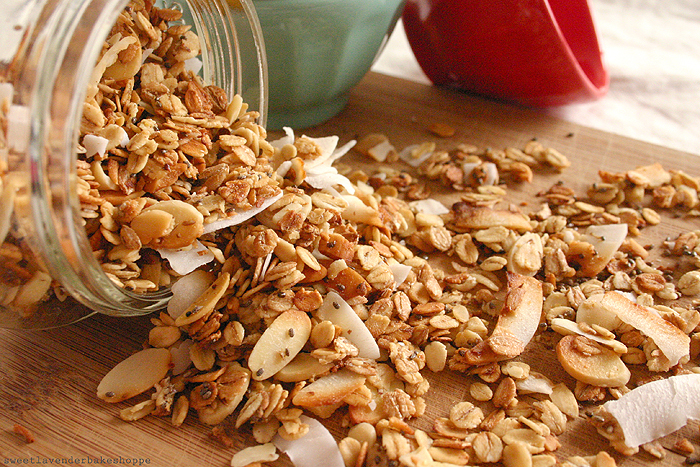 I also had a bag of untoasted sliced almonds- so "Coconut Almond" granola it was! Little tip- when looking for the unsweetened coconut flakes, please get just that. Refrain from the sweetened coconut....confetti stuff. Filled with sugar, it just sort of loses it's nutritional value, which we're sort of counting on here. Coconut is very nutritious! You can find such bags at your local health food store- Whole Foods or (like I did) Sprouts. 1. Preheat oven to 350*F, set a rack in the middle or upper part of your oven, and set out two standard cookie sheet pans. No need to grease or line pans- your granola won't stick. 2. In a large bowl, mix thoroughly together your oats, almonds, chia seeds, and 1 cup of your coconut flakes. Set aside. 3. Mix together your melted and slightly cooled coconut oil, honey, maple syrup, and almond extract. Combine well. Here's a great way to measure the honey and maple so that it doesn't stick to your measuring cup! 4. In a medium sized bowl whisk your egg whites and salt until your whites are frothy. This should take about 3-5 minutes of hand whisking. If you choose to do so in a stand mixer (or use a hand mixer) just beat until frothy, not soft peaks. 5. Combine the honey/maple syrup mixture into your frothy egg white and combine thoroughly. Pour your new egg mixture over your oat mixture and combine completely. There will be a tendency for dried oats to sink to the bottom- so make sure you mix very very well. 9. Remove pans from oven and allow to cool completely. 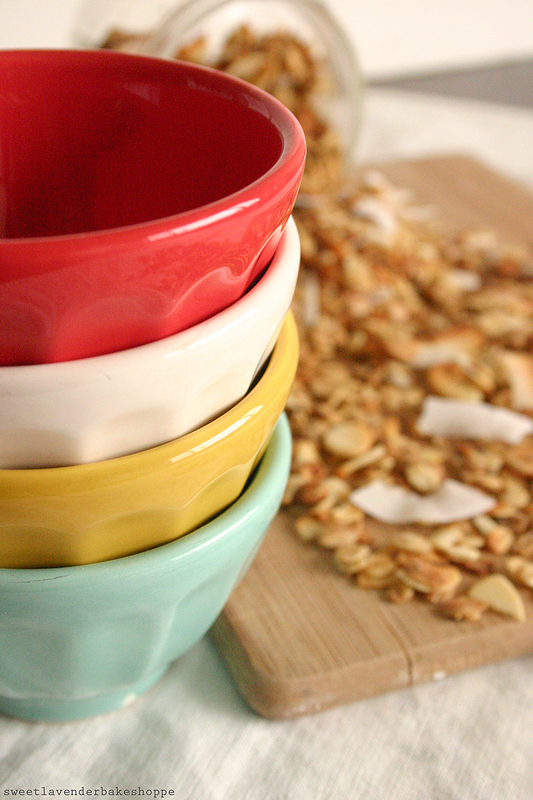 Once cooled, add granola to a large bowl and mix in your remaining 1 cup of coconut flakes. Then simply add to a large air tight container and munch away! Now for the neat-o part! Tropical Traditions has offered to give one lucky Sweet Lavender Bake Shoppe reader a 32 ounce jar of their coconut oil! I don't know if you know how much 32 ounces is....but seriously friends, it's a hefty amount! You'll be able to try ALL those coconut oil recipes and crafts you've been pinning! Coconut oil should always come in this large of an amount! 1. Required entry: To be considered a valid entrant, please click here and subscribe to their newsletter! Then, just leave a comment here on the blog saying you did so! 2. Join Sweet Lavender Bake Shoppe's blog (under "sweet friends") and leave a comment on this blog saying you did so! If you're already a follower, simply leave a comment saying so! 5. Follow Tropical Traditions on Twitter and leave a separate comment on this blog saying you did so or that you already were! Giveaway ends Wednesday, February 6th 2013 and I will announce the winner on this blog post! So make sure you come back next Wednesday and check to see if you won! Open to US residents only. in the next 48 hours to claim your prize! *Tropical Traditions provided me with a free sample of this product to review, and I was under no obligation to review it if I so chose. Nor was I under any obligation to write a positive review or sponsor a product giveaway in return for the free product. 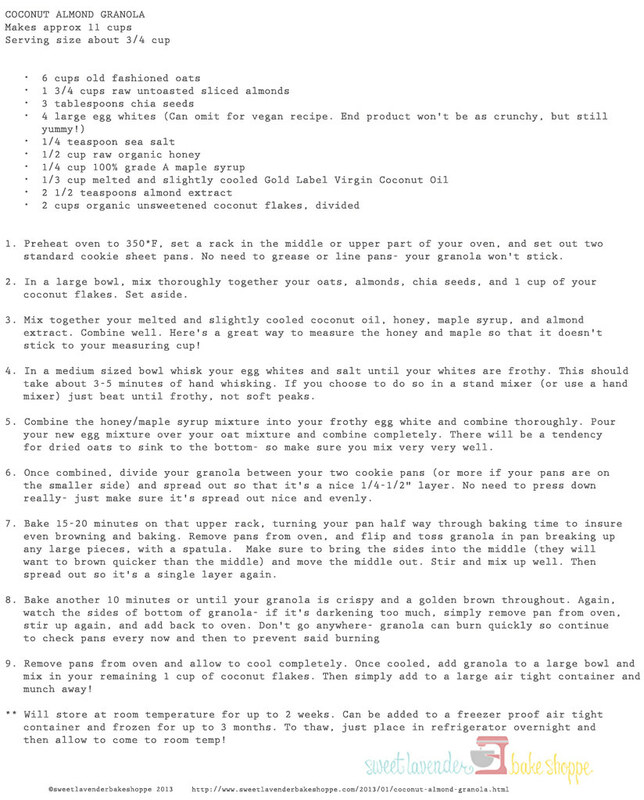 All recipe pictures, opinions, and the recipe itself are my own. Glad to have found your blog through Tropical Traditions website. I am already subscribed to their newsletter and love their coconut oil. Thanks for having this giveaway. Love your blog and am now following. I subscribed to TT newsletter...we love their Coconut Oil! I follow Sweet Lavender Bake Shoppe on Twitter. I Like SLBS on Facebook. Im a subscriber to their newsletter. Thanks! Best Coconut Oil, Thank you, I appreciate it! I am subscribed. 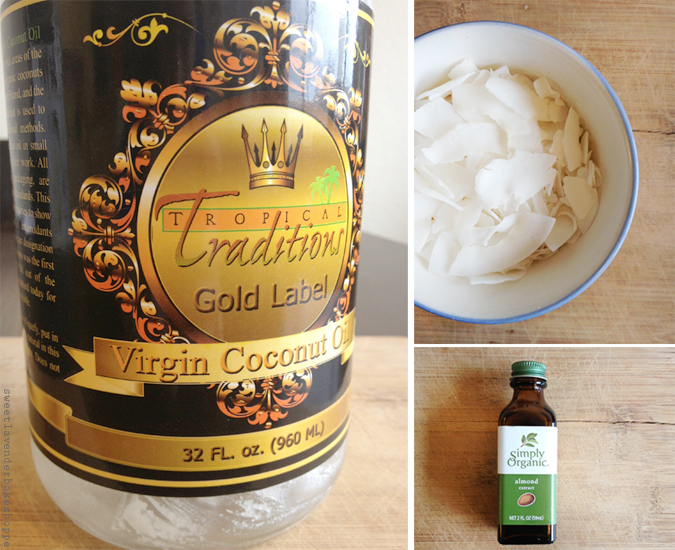 I love Tropical Traditions coconut oil! I also use their dish soap, dishwasher powder and coconut! I substitute the oil for butter in baked goods; use it to fry fish and chicken. I also use the oil and coconut in my Visalus protein shakes everyday. The coconut oil is a wonderful skin care item. I use it instead of lotion. It is also a great hair conditioner. I put a little in my dog’s food everyday as well. These products are amazing! Love them!!! I subscribe to the T.T. newsletter. I "liked" Sweet Lavender on Facebook. I signed up for your newsletter too. 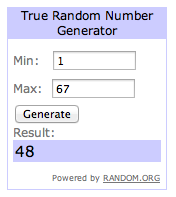 Thanks for the giveaway and good luck to everyone. I liked you on FB as Lle Schreiber! I follow you on Twitter as @LiveLearnEat! THANK YOU FOR THE GOOD OPPORTUNITY!HAVE A WONDERFUL WEEKEND. I'm an email subscriber to Tropical Traditions newsletter! I get Tropical Traditions emails at jefflammers@rocketmail.com. THANK YOU FOR THE OPPORTUNITY, I APPRECIATE IT! Fingers crossed for the giveaway, already a fan on FB!